The petition for pardoning Russian national Yevgeny Yerofeyev and Alexander Aleksandrov convicted in Ukraine has already been submitted to Ukrainian President Petro Poroshenko, Aleksandrov’s lawyer Valentin Rybin told TASS on Wednesday. "The petition for pardoning Yevgeny Yerofeyev and Alexander Aleksandrov has already been submitted to the Ukrainian president for signing," Rybin said. He added that the same procedure is underway in Russia with convicted Ukrainian pilot Nadiya Savchenko. "This is a mirrored procedure. The future of an exchange (Yerofeyev and Aleksandrov for Savchenko) will be clear by the evening," the lawyer noted. Ukrainian President Petro Poroshenko wrote on his Facebook page on 23 May that he is ready to sign the petition for pardoning Yerofeyev and Aleksandrov. He noted that he is ready to do everything possible in order to free Savchenko. "I am ready to use my constitutional powers to bring Nadiya (Savchenko) home. That’s why, if such a petition (for pardoning Yerofeyev and Aleksandrov) is submitted, I will definitely use that," Poroshenko noted. Russian nationals Alexander Aleksandrov and Yevgeny Yerofeyev were captured by Ukraine’s forces on 16 May 2015, in Luhansk Region, in eastern Ukraine. Kyiv claims the detainees are Russian servicemen. However, the Russian Defence Ministry said the Russians "were not active servicemen of Russia’s Armed Forces at the moment of their detention." According to their lawyers, Aleksandrov and Yerofeyev should be considered prisoners of war as both of them were members of the people’s militia of the self-proclaimed Luhansk People’s Republic (LPR) when they were detained. 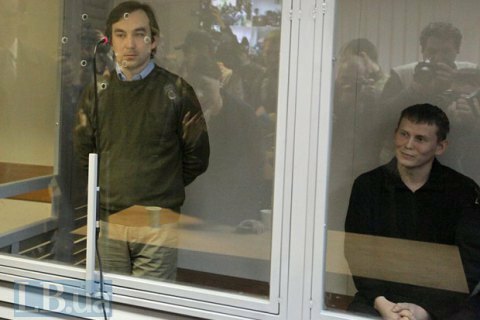 In April, Kyiv's Holosiyivskyy district court found Yerofeyev and Aleksandrov guilty of several accounts, including terrorism, and sentenced them to 14 years in jail with confiscation of their property. The verdict entered into force on 23 May. The Donetsk City Court in Russia’s southern Rostov Region on 22 March found Savchenko guilty of directing the pro-Kyiv forces’ artillery fire in eastern Ukraine that had killed Russian journalists. She was found complicit in the murder of Russia’s VGTRK Media Group journalists Igor Kornelyuk and Anton Voloshin and illegally crossing the Russian border. She was sentenced to 22 years in a general-security penal colony and a fine of 30,000 roubles ($440).